William Paul Whitsett worked hard and became a wealthy man, and wanted to give some of it back to the Boy Scouts of the San Fernando Valley. He endowed them with a building and income to continue its worthwhile program. Whitsett wanted to do more. He was approached by members of the Boy Scout Council and asked about a summer camp for the Scouts. He told the Scouters about a beautiful place in the Sequoia that would be an ideal site for a Boy Scout Camp, the area near his beloved Kern Plateau. In 1947, through negotiations with the U.S. Forest Service, close to 80 acres of land was leased to the San Fernando Valley Council, BSA, starting the first years of Camp Whitsett. During the summer of 1946, a select group of Scouts and Leaders came to Whitsett with the express purpose of getting the camp ready to open. They task was to chop down trees and build campsites for the 1947 season. The first campsites were along Nobe Young and Bone Creeks, the present sites of Castano and Chumash campsites, and the area taken up by the new Nature Lodge (during construction of the Nature Lodge several trash piles were encountered whose contents showed what canned foods were eaten by the Scouts and Scouters). 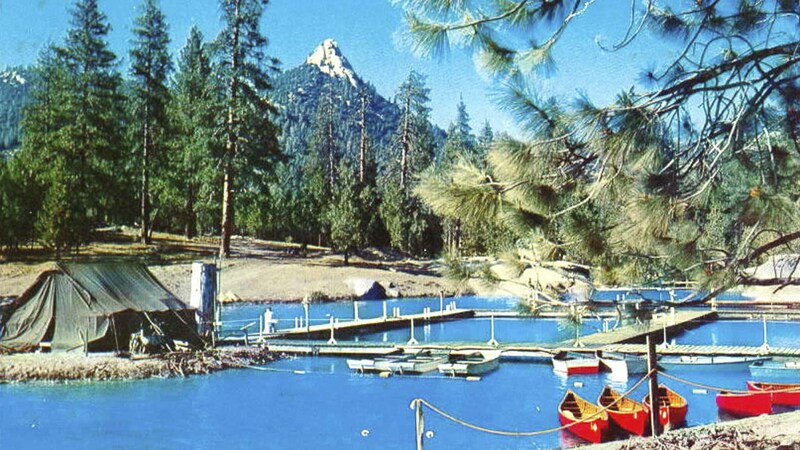 Camp Whitsett opened in 1947 as a summer camp. There was no staff except for the maintenance operation. Units who came to camp that summer brought their own food and program items, and used the camp strictly as a base of operations. As the years passed, more staff and program were added to the camp. In 1949, with the help of Mr. H.A. Van Norman (Los Angeles Water Dept. engineer) and Mr. Guy F. Atkinson, a wooden weir or dam was built to create a small lake, which was named for W.P. Whitsett’s wife, Ida. A story comes to us from Myrtle Harris, granddaughter of both W.P. Whitsett and Guy F. Atkinson. According to Myrtle, she was at the design phase of the dam where Grandpa Atkinson drew out the designs onto cloth napkins, urged on by Grandpa Whitsett. The next day, after the design session, Myrtle had the duty to wash all the ink out of those napkin drawings, a very difficult task (and, of course, destroying the historical plans in the course of her task). Being engineers, Atkinson and Van Norman were able to describe the project in detail to builders from Johnsondale, who built the original dam. They diverted the water and poured the concrete, drilling holes into the rock to secure the sides. One can still see some of the unused holes. The design called for large planks to be dropped into slots, building up the dam board by board. The planks were of different lengths, thus fitting the tapered opening of the concrete frame. The natural water flow through the boards provided the necessary stream flow required in the Forest Service permit. They could control the height of the lake by the number of boards they dropped in. For their reward in building the dam, Johnsondale families were able to use Lake Ida for many years, on Saturday afternoons or Sunday mornings when Scouts were not in camp. In the late 1950s, the frame was filled in and the top of the dam raised to it’s present height. The docks were located upstream from the large rock outcropping in front of Hopi campsite. In 1959, the current concrete dam was built (again with Mr. Van Norman’s and Mr. Atkinson’s help) which raised the lake at least five feet. The waterfront area and docks were moved to their present location. Some dredging and clearing was done and Lake Ida grew to its present size. The old kitchen and dining hall, old commissary/trading post building, and the staff family cabins were also built during the 50s to feed and house staff. I was a camper with troop 63 from Sun Valley in 1954, 55, 56. We camped in Campsite 14, which at the time was the farthest upstream camp on Nobe Young Creek behind Antelope Lodge. This is roughly in the area of the current Tillamook campsite. I worked on the Camp Staff in 1957, 58, 59. In ’57 and ’58 I was on the waterfront as canoeing instructor as well as other waterfront responsibilities. Camp Capacity in those days was about 300-350 scouts. About 15 on staff not including Director and one or 2 other professional Scouters: Volunteer doctor (and family) rotated each week. Chaplain; Smokey (the camp ranger); Marge (Smokey’s wife) who cooked staff food. Campers cooked their own food which was issued daily from commissary at rear of the old Trading Post. In 1959 the authorities (Forest Service) did not permit the filling of the lake due to lack of water. So we improvised a overnight pack-in program in which Jim Oman and I led troops on pack trips out of the Camp to Dry Meadow area and the Divide Highway area. (The ‘Divide Highway’ wasn’t a highway at all at that time … just a semi-improved logging road). The program was pretty basic. Jim or I would take a group to one of the areas. They carried their personal gear in backpacks and 1 or 2 burros carried the food and other gear. We would drop the group off in around noon or so and then bring the unloaded burros back to camp. The next day (sometimes 2 days) one of us would pick up the group and return to the Camp. This was a pretty big deal for many of the Scouts because many had very little back-pack experience. However, they (I) really missed splashing in the lake. Smokey bought a horse, Diablo, that year and I rode him every weekday for 8-10 hours, for 8 weeks. The other animals: 1 horse and 6 burros were rented from someone by Roads End. Camp grew with more and more Scouts and Leaders attending, along with an expanded program. The concrete block commissary/kitchen building was completed around 1960 and used to store the food to feed the campers. All campers ate jamboree style in those early days. Scouts got their supplies from the commissary and prepared their food in their campsites. Two food deliveries a season literally stacked food to the rafters. Weekly deliveries of milk, bread, fruits and vegetables ensured fresh perishables freshest. After the completion of this building, the old commissary building became the Handicraft Lodge and the Camp Program Office. There was a tremedous rainfall in December of 1966. Reports out of Johnsondale said that over 24 inches of rain had fallen during the 24 hour period from Sunday, December 4th through Monday, December 5th. Johnsondale was flooded, the road from Camp to Kernville was closed from a large slide and a portion washed away by the Kern River. Kernville was flooded and the North Fork bridge at Kernville was washed away. There is a picture of Lake Ida during the flood, the rocks on either side of the dam were completely submerged and Hopi campsite was underwater. The river flow in Kernville at the peak of the flood, was estimated to be over 100,000 cfs (cubic feet per second – 500 times normal). Lake Isabella went from about 100,000 acre feet to over 314,000 acre feet in two days. During the winter of 1968-69, Camp Whitsett saw unprecedented snow fall. In low lying places, there was as much as twelve feet of snow. The snow load collapsed Antelope Lodge, the dining hall and the old commissary building. Also (according to “rumor”) the main beam in the new commissary building cracked. A “Temporary” Staff Recreation Hall (really just a shaky platform floor covered by old military style tents) was set up on what was the upper part of Staff Hill (Top-Of-The-Hill and Camelot). It housed several chairs, couches and, best of all, a refrigerator for snacks. A fire which had started in the public campground (Area 3), swept through the northern edge of Camp Whitsett in 1971. It burned around the Tillamook campground and the staff area, and scorched many acres of land and a number of trees. Thankfully no permanent camp buildings were damaged (the staff rec hall on staff hill was dropped and parts burned in the fire) nor were there any injuries to staff or campers. A very scary time for all concerned—unfortunately our fire plan failed and Scouts were scattered throughout the camp. New fire plans were put into place and are practiced weekly. No major problems have arisen since to have to use the new fire drill. San Fernando Valley Council and Crescent Bay Council of the BSA merged on July 1, 1972 bringing together more than 30,000 Boy Scouts into the Great Western Council, BSA. The new council added a small central dining option to the camp. The camp grew as new program and more skilled staff were added during the ensuing years, bring camp to its present great program. In 1985, the GWC became the Western Los Angeles County Council in order to give the council a “geographic” presence, to let contributors know where the council was located. A disastrous fire started during the winter of 1987, when all water pipes were frozen, which burned the Rangers house to the ground. Thankfully no one was hurt, but the Rangers, Alex and Diane Sanchez, lost almost everything in the fire. Local Kern Valley citizens came to their rescue with supplies and even a mobile home (which was placed in the same spot as the old quarters). In 1989 a beautiful new Ranger’s house was built closer to the entrance of camp, and has been gratefully used by the Camp Ranger’s since. Until 1990, campers provided their own tentage when they came to camp. A number of small, Free Spirit tents, were provided in some limited campsites. The desire for tents increased, so platforms and wall tents were added in 1995. White water rafting began as a special program feature in 1990, making Whitsett one of the only camps in the nation to offer the program on a regular basis. We use a Kernville rafting company as our major subcontractor in this most popular activity. The number of campers desiring Central Dining grew until it has become the main feeding program at Camp Whitsett. But, Camp Whitsett is one of the only camps that still offer Jamboree Feeding as a lower cost option. 1995 saw several other major changes to the camp: The kitchen was moved to the Commissary building in an area that had housed the Trading Post; The Trading Post moved to the old Maintenance Shed (the miracle of the entire operation—a real Silk Purse from a Sow’s Ear); The maintenance operation moved to the new Ranger’s living quarters; The High Adventure program moved into the old kitchen building; and, the old dining slab became a Staff area and High Adventure base. The 1996 season began with a grand reunion of Camp and Council staff members, which included members of the W. P. Whitsett family. Whitsett’s granddaughter visited the camp for the first time EVER. She along with several cousins, were impressed and amazed with the facility that sported their ancestor’s name. More than 300 former Camp Whitsett staff members and their families were in attendance for the kickoff weekend, a memorable event that brought together staff members from the 50s, 60s, 70s, 80s, and 90s. Everyone left with a feeling of complete satisfaction and delight to see how camp has progressed over the years (and how young everyone looked). The 1996 season was also the largest ever, with over 2500 campers using the new facilities and program. Horses were added to the Whitsett program, using the adjoining Carver property. The year started with ten horses; it was soon seen that many more would be needed in the future. In 1997 a new dock was built at Lake Ida, and what a dock it is. Longer and wider than the old, the new “marina” included a boat pier! Drinking water was piped to the end of the dock so staff and Scouts would not have to walk out of the Waterfront to get a drink A new changing rack and instruction area was built, complete with a foot wash. Electricity was brought to the lake bringing the Aquatics area up to modern times. (Gosh, running water, electricity, a new marina – what next?). 1998 was another banner year. With the major projects built, sprucing up was the key word. Part of Lake Ida was cleaned out, helping to deepen some swimming areas. Our Scoutcraft program, already one of the best in the nation, grew even bigger. The staff manned everything from horses to bikes — ran Scouts through lake oriented Merit Badges as well as Shooting Sports. The Indian Lore area was spruced up even better, and Ecology/Conservation spread its word throughout camp. Handicraft staff increased in numbers. This was also the year that the Whitsett Sierra program started. 1999 dawned auspiciously. Many weeks at Whitsett were full by Christmas. Was this going to be a record breaking year? The answer was a resounding YES! The program was better than ever. The food was fantastic (over 90% of the Camp Evaluations were positive to glowing about the food). Other areas of Lake Ida were scooped out making the lake larger and deeper. Staff put out a tremendous amount of energy to make this the best program year ever. And the numbers? How about 2,787 Scouts and 645 leaders for a grand total of 3,434 campers. Not only was the record broken for the total number of campers for the season, but the biggest week record was broken three times: 477 for week five, 490 during week 7, and a whopping 511 during week 8. PLUS, one unit from Massachusetts attended the Whitsett Sierra program. 1999 was also the year that Camp Whitsett entered the electronic world — the Camp opened its own web site at www.whitsett.org. Whitsett 2000 is starting off as big and may be even bigger than last year. The new Camp Director, Hoss McNutt, was instrumental in getting the ball rolling on the building of the much awaited staff cabins. The passing of John Reeve, a young friend and Nature Director of Camp, has gotten another ball rolling, the also much awaited Nature Lodge. Before the 2001 year a total of eight staff cabins were available to Camp Staff. A new 20 foot section was added to the Big Top bringing the length to 100 feet. It was getting a bit embarrassing – ANOTHER record year! 2002 was to be the biggest year of ALL TIME; over 3,600 campers were scheduled for the summer. This summer was also to be the International year – Whitsett was to host a troop from Japan. Staff trained and readied themselves for the “hordes”. Jim Uny, the Camp Ranger, expanded and enhanced the Horse Corral. The whole area was able to handle any number of Scouts, and included an arena-sized riding area. A PHOTOGRAPHY program was begun under the capable hands of Becky Smith (an 18-year staff veteran). Everything was working perfectly. Then, Session 4 dawned. Sunday July 21st started ordinarily enough. Staff Sleep-In Day, special Staff Brunch, Staff Meeting, and waiting for the Scouts and Leaders AND the special unit from Japan. “The best laid plans of mice and men, oft times go awry” — actually, the Best Laid Plans came into full force that afternoon. About 2:00 in the afternoon, a fire started just below Road’s End Resort and rapidly spread up and down the river. The upward thrust of flames endangered Camp Whitsett. For the first time in Whitsett’s history, the entire camp was evacuated (and the Best Laid Plans WORKED!!). 350 campers and 85 staff members shifted operation to Hot Springs School in California Hot Springs. Go HERE to read all about the remarkable three weeks and see some pictures of this Never to Be Repeated, Once-in-a-Lifetime Adventure. Camp was able to open for the last two sessions. So, even though over 1500 campers were unable to enjoy the Whitsett Adventure, we did end on a positive note. The damage to camp was minimal (25 tents and platforms and some tables in the Outpost area), but the 160,000+ acres destroyed in this senseless conflagration will take more than our lifetime to come back. 2003 was another banner year (yes, again). 4,000 Scouts and Leaders attended Whitsett for a remarkable summer. A number of fires broke out in Southern California during the spring and summer, that caused the closure of several camps. During our summer of 2002, when Whitsett was surrounded by fire and we had to evacuate for three weeks, several camps adopted the Scouts and leaders slated to attend our camp. To show good faith and to be “good Scouts”, our Council took in almost a hundred Scouts and leaders during one of our biggest weeks. Over SIX HUNDRED Scouts and leaders attended one session of Whitsett — at least a hundred over maximum. Units were shoehorned into every nook and cranny of camp, and our dining went on split shift. Camp Whitsett, thanks to the outstanding staff, was able to run the program for the week, but the cost was worn out people and facilities. People were very tired but the Whitsett program did not falter. The Kitchen outdid itself, while the Kitchen supervisor and cooks worked 10 to 12 hour days with little rest. Our pleas to the Council to NEVER do that again were answered. The reason they allowed such a large number of campers was “well, they took in our campers last year.” As I pointed out to them, the other camps were not FILLED TO THE BRIM when they took in our evacuated campers. Whitsett Staff proved that they could overcome ANY problem thrown their way. And, the remarkableness was more than numbers. During a two week period in the middle of the season, Whitsett experienced heavier rain storms, closer lightening and thunder, and more rain fall then it had experienced in the last 30 years COMBINED. Storm cells blew through bringing over two inches of rain in one hour on two different occasions. There were several other lesser storms. Stream beds, normally dry, were running water at an almost torrential rate. A large stream ran from the ranges down through Zuni Campsite, actually flooding two tents — one had a stream running through it!. Camp was booked by October 14th for the 2004 season. Because of the late date for Labor Day, a 9th session has been added for the 2004 season, bringing the possible total campers to over 4,500. Unfortunately a large number of units books more Scouts than they ended up bringing to camp. By the end of the summer, though, over 4,000 Scouts and leaders made Whitsett their summer experience. The summer actually started with a unique opportunity. The High School based group knows as the Junior Reserve Officers’ Training Corps, or Jr. ROTC, booked Whitsett for a very interesting and exciting five days. 350 High School aged young men and women, known as Cadets,, and about 40 military advisors, used the camp for their summer training program. The training included Rapelling, Archery, Cross Country Orienteering, Aquatics, Hiking and lots and lots of PT (physical training, although many participants said it stood for Pain and Torture). The Whitsett staff ran the activities, plus the feeding operation, with lots of help from the ROTC staff. It was a unique opportunity for the Scouts to see how the Military ran, and for the military to see the Scouts in action (at least the Staff). Another special feature of the 2004 year was the addition of a 9th session. Once every 6 or 7 years the Labor Day holiday comes later in September, with the subsequent start of school coming a week later than normal. Because of this, one week was available for campers, so the WLACC added Week Nine for 2004. The attendance and program was, well in a word, underwhelming. A total of nine units attended (77 Scouts and 26 leasers). We were very low on Staff (this summer many schools began EARLY to finish the semester before the Christmas Break). That early school start and small attendance created an interesting situation (we had almost as many campers as staff). The camp no doubt lost money on this week, but we had a GREAT time (very close relationships with the campers) and many, many thanks for staying open. Some units would not have had a Summer Camp experience if we had not run Week Nine. Summer 2005 turned out to be an excellent year. Camper numbers averaged just over 500 campers a week. Program was better than ever, with exciting new Directors leading staff into excellent service for all Scout and leaders. The season began with a 2nd visit by the Jr. R.O.T.C., and continued through eight camp weeks. A new, online, Merit Badge system was put into place this year. Camp Emerald Bay (our sister camp on Catalina) used the procedure in 2004, and Camp Whitsett joined in during the 2005 season. Leader signed up Scouts for Merit Badges before camp started. During the first few days, Scouts were able to change their “schedule” and take those classes they wanted. Troops received a Group report that showed a synopsis of The Merit Badges their Scouts earned as wella as the partial requirements passed. In addition units received an Individual report for each Scout listing the same information. These reports are used to complete the Troop Advancement Report, and the Scouts and units have permanent, consolidated reports of Merit Badges. Since everything is on the Internet accessible computer, record of partials is always available. The Friends of Whitsett in conjunction with the Western Los Angeles County Council, took on the task of creating a Long-Term Plan that will help the council and camp plan for 10 years into the future, plus. Two committees were formed: The Facilities Committee and the Program Committee. The Facilities committee met several times before and during the summer and have a created a great start to the Long Term Plan. 2006 brought about some of the biggest changes in Whitsett history. Clif Stewart came on board in late 2005 to be the new Full Time Whitsett Director. His job, and his only job in the council, was to administer Camp Whitsett. 2006 was another banner year, with two excitings things happening in camp. First the Overnight program was expanded to include all units for one night out of camp. The units hiked, rode bikes or horses to the overnight area where they were fed an outstanding meal of Tri Tip and great side dishes. In addition to the excellent food, several program features were added including mountain man crafts, fly tying demos, great sport games, and a campfire. The overnight facility was improved with the addition of picnic tables, covering dining flies, and new cooking and serving equipment. Through the outstanding efforts of our Director of Facilities, Jim Uny, the Handicraft area expansion was started. A slab was engineered and poured*, and the metal structure was begun. This enlarges the Handicraft Area, and begins the future expansion of this popular program facility. A roof is planned for the 2007 season. This project will keep Scouts and their projects off the dirt and provides a permanent floor for building. One interesting side note. The concrete trucks came to camp and began to pour the slab in the prepared site. As they began pouring, the “sidewalk superintendents”, the “experts” watching the whole process mumbled to each other, and announced that there was not enough concrete to finish the job. They began to search for and transported large rocks to the site to drop into the holes dug for the support columns, to take up some of the volume. They kept looking at the pouring, shaking their heads. Meanwhile, Jim Uny quietly looked into the concrete drums on the trucks, tapped the sides, and figured out the volume of concrete left. He said, “Leave it to the numbers. There is enough.” The Doubting Thomasas looked on with long faces, Jim said, “Trust the numbers”. When it was all over, there was plenty of concrete left over, including several wheel barrows full that were used for some other projects. For many years camp improvements were of the “sew-a-patch-on-a-tent” variety. Not much money nor time was put into improving Camp Whitsett. When the former Scout Executive, Hugh Travis, came on board, that all changed. And, the current Scout Executive is continuing with that practice. Things went along well, if a bit slow at times until Jim and Gloria Uny came to camp. Since then the projects have flown fast and furious. It has already been mentioned about the projects that were completed in the past couple of years. But, nothing could have prepared us for the 2007 season. The staff arrived at camp with: 1) A beautiful new Staff Lounge, 2) an amazing upgraded Handicraft Area (Antelope Lodge lives! ), 3) a new Bridge to Comanche campsite at the top of the lake, 4) a new bridge over the creek to Klamath campsite, 5) a CLEANED up and trimmed camp facility, 6) and cleanup, fixing, maintaining of all the camp structures and even the forest area —- Jon Mackenzie helped find the money for the projects, Jim Uny, Gloria Uny, Mark Beadle, Norma Beadle, and Thomas Girard, along with the expert help of Chandy Russell did the physical work. When Scout and leaders arrive in 2007 they might not notice some of the changes, but others will stand out with a big WOW! coming from their gaping open mouths. The 2008 Camp Year was another best. A number of new facilities were added to the already fantastic areas already in use at Whitsett. Eight new Staff Cabins were put in full use by the appreciative staff. These cabins bring the total number to sixteen, providing housing for a total of 128 — during the summer the staff doesn’t fully use the cabins, but off-season groups will have plenty of sleeping places. The Staff Lounge, dubbed “The Feldman” by the staff, was dedicated in a touching ceremony and opened for use (it was called the Feldman because of the generous contribution toward the lounge by the Jeff Feldman family). The Lounge in the upper staff area off of the parking lot, will serve as a Staff Lounge during the season, and as a conference center the rest of the year. The Lounge includes an office area, restrooms and, the largest meeting room in camp, and best of all, is the only air conditioned building in camp. The triple-wide mobile facility is a great place equipped for may uses. A “New and Improved” Frontier Area which combines Indian Lore merit badge with all the acitivities of the old Mountain Man Area, was established in the wide, open space in front of Yuma campsite (near the Archery Range). Scouts can visit the TeePee set up in the Frontier area to work on their Indian Lore merit badge and Native Ameridcan crafts. They can crack whips, toss tomahawks and throwing knives, cast souvenirs, and help cook up some Dutch oven delecacies. The Carver Overnight Experience located on Carver Ranch has been part of the camp week for over a decade. This year, a completely new facility was opened which included covered eating for almost 200 people, a complete outdoor cooking facility, a real campfire ring, and a corral. A large open area was available for a number of activities (including a wicked game of Dodgeball) and sleeping. Water from an artesian well was piped onto the site, and porta-potties put into place. This area became the overnight home to one-third of the camp each night. Scouts and Leaders hiked, peddled bikes or rode horses to the site (the gear was transported by the staff), were given water and punch after the hike, and were served a dinner of the best food in the forest. Everyone liked the whole experience and literally raved about the delicious dinner which served both carnivores and herbivores alike. The scrumpcious food was cooked by the Camp Ranger and wife, Mark and Normal Beadle. Scouts taking the Hormanship merit badge and those learning to ride the horses, had a super new riding corral at their disposal. During last summer and off season, the horse stalls were relocated and refurbished, water lines established, and new signage put into place. With that work in place, the area was dedicated as the Joh and Eva Mackenzie Equine Area. Handicraft, most recently housed in the old Camp Kitchen located on the hill above the Dining Slab, has had multiple homes, the most of ANY area in camp. For 2008, the Director of Facilities Jim Uny, Camp Ranger Mark Beadle, and Thomas Girard gutted the old kitchen and, finding the base structure to be sound, rebuilt the facility. They completed the roof over the newly poured slab (see above) and created an amazing new Handcraft Area which includes lights for night-time use. This, the most popular area in camp, was used by just about every camper and most of the staff during the summer. In off hours on weekends, the Handricraft Area became the location of planned and impromptu staff activities. The 2007 Camp Program combined all the greatness of the old with the excitement of the new. Many areas were staffed by a number of returning staff, with the infusion of new directors and staff which added an exciting new element. A new program called Trail to Eagle which was established and run by Chuck and Pat Smith, was added to the early evening activities. Eagle Scout candidates, or those getting ready to start final work on their Eagle Award, were invited to three sessions a week. The first session introduced the steps to becoming an Eagle and included how to properly fill out the final Application. The second meeting covered the idea generation, planning, getting approval, and carrying out of the Eagle Scout Service Project. The planning and execution of the Eagle Court of Honor and general topics were covered in the third session. Those Scouts who attended were given a CD which contained digital copies of all the paperwork introduced during the Program, as well as resources for the Scouts personal needs and uses by the Unit. This program was well received and will continue with some improvements for the 2008 camp season. The 2007 camp season ran smoothly and provided almost 4000 Scouts and Leaders with a fantastic Scouting experience. Staff is very proud of their accomplishment during the season and are looking forward to another super year in 2008. The 2008 camp season is beginning with some new and exciting editions to Camp Whitsett. The ladies shower and adult bathroom facilities have been expanded to accomodate more adult usage. The Trading Post exterior was renovated with an expanded slab in front with a new shade overhead. New refrigeration will allow for more storage with a fantastic new driveway poured on the rear to allow delivery trucks to back right in. The side doors were replaced allowing better access to the store. A Boathouse was constructed at Lake Ida to hold the boats and other Waterfront items for off season storage. In 2009 the camp season was cut back to seven weeks rather than eight. The camp numbers were down but the weeks were full and busy: the summer was successful. No new buildings were added but he current facilites were used to their utmost. All program areas had a successful season while the Carver Overnight experience and the horse program experienced an exceptional year. 2010 was a year of change. Camp ran only 6 session, albiet full sessions. Week 3 which would have been in operation over the 4th of July week came up with such low numbers that the week was cancelled. Work projects were scheduled during that week, and the annual Family Weekend kicked it off. Chuck Smith, the long time staff member (36 summers) and his wife Pat Smith (20+ years) retired from active camp involvement. Chuck did visit off and on during the summer and is the President of the Friends of Camp Whitsett, the “alumni association”. Jon Mackenzie, with over 30 years at the Scout Office supporting camp efforts (both Whitsett and Emerald Bay) left council employment. Clif Stewart, formerly the Camp Director, came on board as the acting Camp Ranger. The total camper numbers were up about 4% over the 2009 season and is another good year. A fire near Kernville didn’t threaten camp (too far away) but the effects were felt. Fire broke out on Bull Run, on Monday of week six, an area north of Kernville on the west side of the river. High winds whipped the fire and caused it to jump the Kern River and burn homes and structures in Riverkern. Power and phones lines were down and the road closed at Riverkern. With no power and phones, camp was cut off. The road through California Hot Springs and over Western Divide Highway into Springville provided physical access so there was no real danger. Batteries were used to power a computer and the satellite internet link, so some contact was maintained. This webpage and the new Facebook Page kept parents informed of the non-danger and status of camp. A large generator was sent to camp and provided power for a day or two for the commissary and freezers and, most importantly, the kitchen and one shower facility. Power was resored by day four, and phones shortly thereafter. According to a Verizon Phone Company source, Edison was in the fire area almost immediately, even as the poles were still burning, and replaced poles and lines. The Forest Service, fearing outbreaks and downed lines which might spark other fires, didn’t allow Edison to turn on power for a few days. Verizon’s cables were delivered and they immediately restored their lines and the phones were up. The campers in camp week six and those arriving for week seven, came to camp via Ducor and California Hot Springs. The road reopened Tuesday of week seven. The rest of the week as well as camp closing activities came off without a hitch. The 2011 Season was another season of change. A major program was cancelled and one changed. The loss of the Horse Program, including the Merit Badge was a light impact on the camp program. Horses are costly to rent an feed, the few Scouts who took the Merit Badge and the small number who went on the rides, were going to be serviced by a contract with the nearby “R” Ranch (Old Johnsondale) and by an outside contractor in the Ponderosa area (on the Western Divide Highway). The Overnight Area was moved in camp to the area that once was Comanche campsite on the upper end of Lake Ida. Both programs were fairly new additions to the camp and, while the loss was an emotional one to those most closely involved, it didn’t adversely affect the Camp Whitsett experience. The yearly Alumni Reunion, now dubbed the Camp Whitsett Family Camping Weekend, was a resounding success. The number in attendance, including the 2011 staff, was nearly 200. The amount of money raised was a new record, much of which is to be plowed back into the camp program. 2012 saw another good year of camp attendance, and saw Whitsett enter the world of entertainment. A well-known production company started filming a program entitled “Are You Tougher than a Boy Scout”, a reality show pitting current Scouts with former Scouts in a series of contests. The series will be broadcast on a popular cable channel in the near future. This will bring great publicity to Camp Whitsett.